When I wrote about Empire Games (my review), I noted "the level of Stross's writing is actually beginning to rise to the level of his ideas" and that once Stross got the story rolling, nothing distracted from the cool ideas of the world walking between the worlds we've already known and the opening up of new worlds and the drama of the how the United States interacts with the world walkers from a parallel universe. Dark State picks up almost immediately after the conclusion of Empire Games, and despite the increasingly breakneck pace of the second half of that novel, Dark State suffers from some of the same issues that Empire Games did. Stross spends at least a third of Dark State resetting the playing field and planting the seeds for where the rest of the novel and trilogy will go. That's fine, as far as narrative conventions go, but Stross is not at his best as a writer when working with a more deliberate pace. The A and B stories of Dark State are probably first that of Rita, the daughter of Miriam Beckstein (from the original Merchant Princes series) who was given up for adoption as an infant, but who has an unlocked world walking trait and who was recruited by the United States government to both infiltrate and liaise with the alternate timeline which has the former Clan in a position of power; and second, that of Elizabeth Hanover, a princess of from that alternate timeline looking to escape a life with an arranged marriage and defect to the Clan led government in New London. I'm grossly simplifying the story lines, of course, and Stross develops each of them far beyond what I've given, but we know from Empire Games (and the Merchant Princes) that the United States will go farther and go darker in their plans to "protect the Homeland". That definitely is a factor here and it permeates almost everything in Dark State. As with Empire Games, when Charles Stross decides he wants to move the story, the interesting stuff happens. I’m engaged as a reader, he’s not giving the reader much time to take a breath and he’s making stuff happen. It’s when he is in set up mode, we see the clunk. Dark State is not as acronym heavy as past Stross novels, though there are references to BLACK RAIN and such, but there are moments early in the novel which feel overly didactic. Those moments come across less as storytelling and more as just telling. 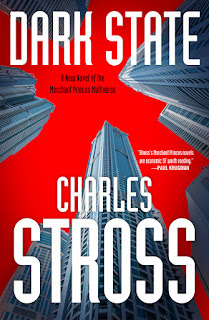 In ways that are completely typical for reading a Charles Stross novel, I can only say that I was less annoyed as the novel progressed – to the point that I only noticed very late in the novel that I was finally engrossed in the story being told. I don’t know that it was good, in whatever nebulous way I describe a good novel, but it was better than how Dark State began. This is nearly always the case with Charles Stross. Whether it is reengaging with his particular brand of flow or if it is just waiting for that moment he decides to stop revving the novel’s engine and punch the gas, I like the ride when he’s moving. Dark State has left me far more conflicted about the new trilogy than Empire Games did. 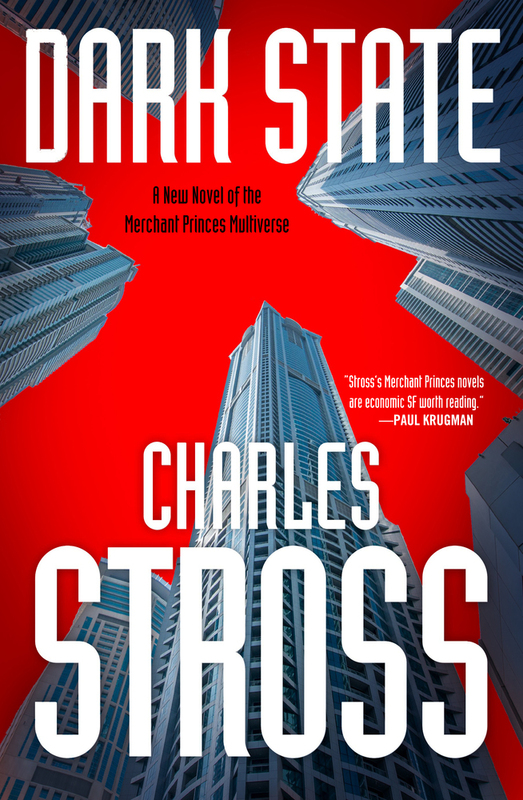 I’m not sure if it was the excitement of stepping back into Merchant Princes or if it was that Stross seemed to have leveled up a bit since he last stepped into this world, but Dark State does not quite live up to the promise of the previous novel. Readers are still left with plenty of interest in how Stross will wrap things up and interest in what new cool stuff he will introduce and tweak. The ideas in Dark State remain as fascinating and involving as ever. It’s just what he does with his ideas that do not measure up. Bonuses: +1 the stuff in timeline four with the destroyed Earth through the portal adds an extra bit of intrigue to what might be going on with the other unexplored timelines. Penalties: -1 clunk clunk clunk. Nerd Coefficient: 6/10, "still enjoyable, but the flaws are hard to ignore" See more about our scoring system here.